- Work in vertical lines from the bottom upwards. - Bring the needle up at 1, and insert the needle again two intersections above the starting point at 2. - Bring the needle up again to the left of the starting point (3) and repeat across the row. 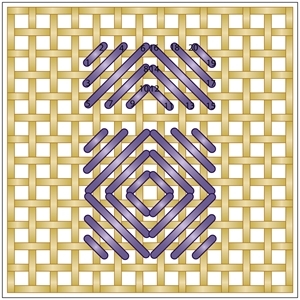 Uses: Filling stitch, repeated geometric pattern. Also known as the Florentine Stitch. 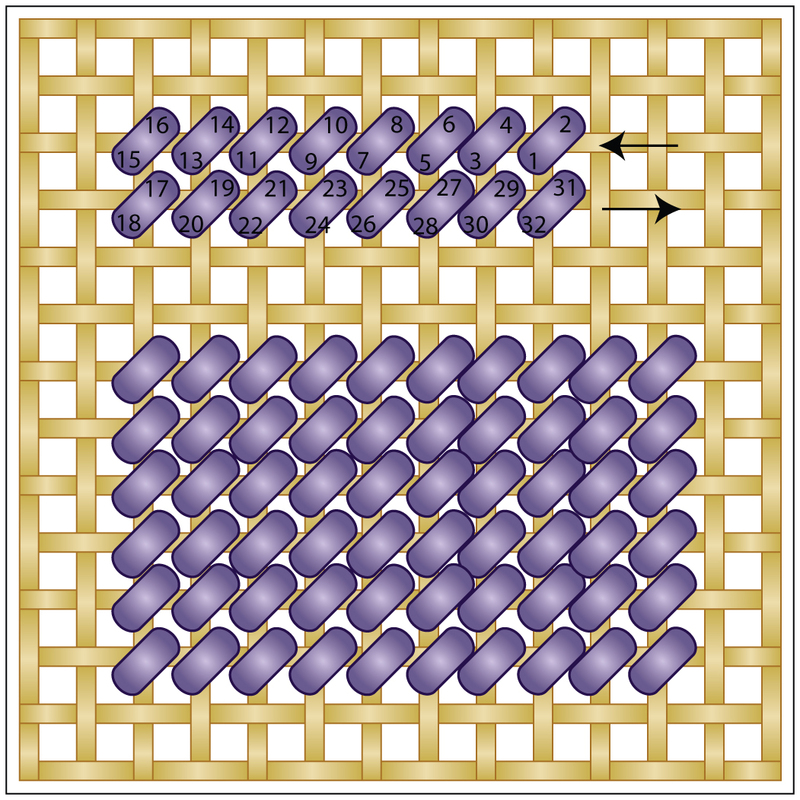 This stitch can be worked in countless variations, by altering the number, and size of the stitches in each repeat. - Worked in upright long stitch or satin stitch. - Work your first row from left to right. Bring your needle up at 1 and down at 2. - Bring your needle back up at 3 and down at 4. - Bring your needle back up at 5 and down at 6. 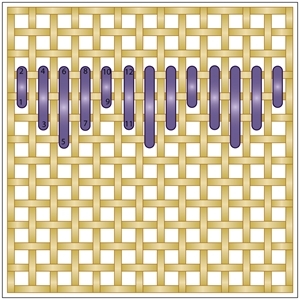 - Subsequent rows can be worked from either the left or right, with the stitches fitting those of the preceding row. - Use three of four shades of a single colour family for alternating rows to create a lovely affect. - If the thread is not giving the coverage desired and the canvas is showing, use a thicker thread. 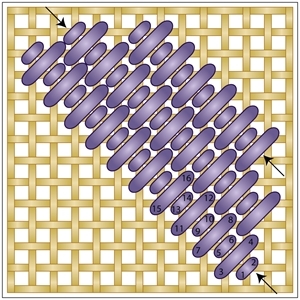 Uses: Filling stitch, similar in appearance to the Tent Stitch. 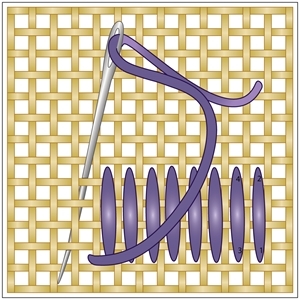 - Work the stitch diagonally, starting at the lower left at the intersection of the threads, rows will be worked diagonally down then up the canvas. - Form each stitch by bringing the needle up at 1 and down at 2. - Skipping one row between stitches. On the downward rows your needle will be moving vertically; on the upward rows, horizontally. - Form first stitch of an upward row below last stitch of a down row, and the first stitch of a down row to the left of the last stitch of an up row. - Turn canvas to fill in the corner above the first row. - To make sure you are executing the stitch correctly turn your canvas over and look at your canvas. The stitches should look like a basketweave. Can be worked horizontally to imitate the look of brick, or vertically. - Work the stitch by bringing the needle up at the target hole at 1, over 2 lines of canvas, and placing it down at 2, working left to right along the desired area. - The next row is worked identically, but right to left instead. Also known as the Tent Stitch, this is a popular tapestry/needlepoint stitch. Uses: Common filling stitch for large areas, used quite a bit in miniature tapestry/needlepoint. - Done horizontally, starting at the upper right, work each row of stitches from right to left. Form each stitch by bringing the needle up at 1 and down at 2. - Bring the needle back up at 3 and down at 4. - At the end of each row, finish the last stitch, leaving the needle at the back of the canvas. Then turn the canvas completely around and start the new row in line with the row just completed. - The Continental stitch is prone to distorting the canvas so be sure that you don’t tug your thread as you stitch. This bulky stitch is worked like its counted-thread counterpart. - Bring needle up from the upper right at 1 and down to the lower right of the intersection of the canvas at 2. 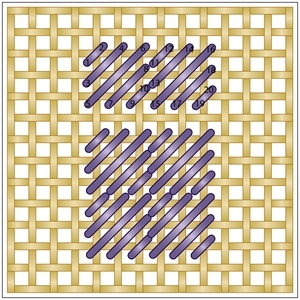 - The second half of the stitch is worked from the top left at 3 to the bottom left of the intersection at 4, creating the X of the stitch. 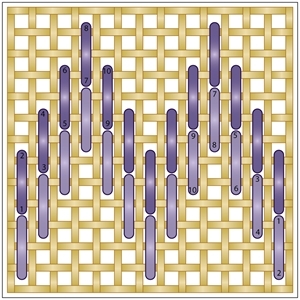 - To make rows of cross stitch work an entire row, upper right to lower left, followed by the entire row worked in the second direction upper left to lower right. - It’s best to work rows of cross stitch in your tapestry/needlepoint design so that you produce tidier uniform stitches with even tension. Uses: Beautifully textured filling stitch. - Work in diagonal rows. Bring your needle up at 1 and down at 2. - Next, bring your needle up at 3, across two intersections and down at 4. - Repeat to fill the area, working a diagonal row upwards from lower right to upper left. - Then, reverse the direction, working from upper left to lower right for the next row. 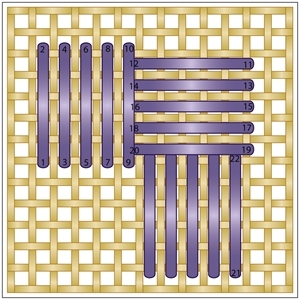 Uses: Make shapes and fillings by combining stitches of different lengths. This stitch is a textured tapestry/needlepoint stitch similar to Satin Stitch and is used to fill large areas of canvas. It can be worked in differing lengths in varying directions to create a design, or worked in a single direction. 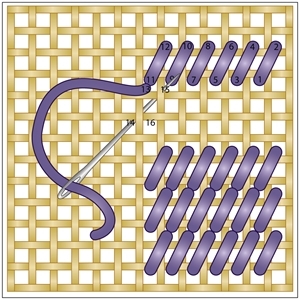 - Bring needle up at 1, this diagram shows skipping three rows, and bring the needle down at 2. - Bring needle back up at 3 and down at 4. - Vary the length of the stitch for an interesting design. 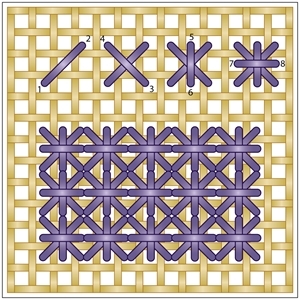 - Work your cross stitch base over four canvas threads bringing your needle up at 1 and down at 2, and then crossing your x by bringing your needle back up at 3 and down at 4. - Next, make a small diagonal stitch over each “leg” of the cross stitch over two canvas threads by bringing your needle up at 5 and down at 6. 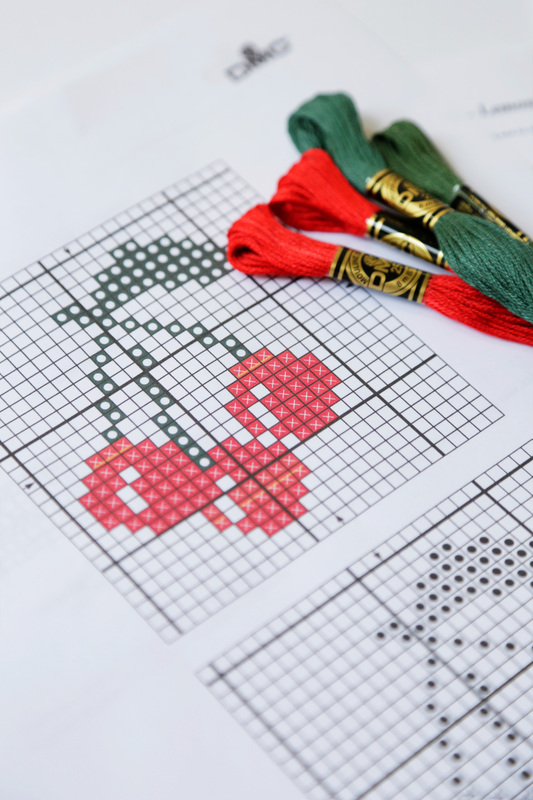 - Continue making small diagonal stitches around the base of your cross stitch by then bringing the needle up at 7 and down at 8, then up again at 9 and down at 10, then up at 11 and down at 12. - The Rice Stitch is similar to cross stitch, with the exception of each “leg” of the stitch having a diagonal tacking stitch. Uses: Filling stitch, background stitch. - Work diagonally as a square. - Start at the upper right; each block of five stitches is worked across the row to the left. - Bring needle up at 1 and down at 2, then from 3 to 4; 5 to 6; 7 to 8; 9 to 10; then up at 11 to start the next block. - At the end of the row, turn the canvas and line up the next row with the previous one. Variation of the Scottish Stitch. It features Scottish Stitch blocks framed by Tent Stitch Border. 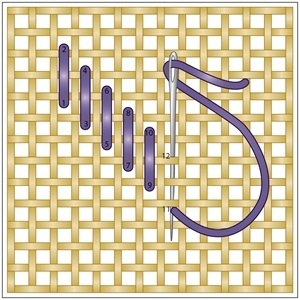 - Next work the uppermost stitch of the Scottish Stitch centre (9 – 10) followed by two additional border stitches (11-12 and 13-14) - Following the numbered pattern, continue to stitch steps 15 – 20 to complete one stitch. Uses: Background areas and borders. Similar to standard Scottish Stitch. The difference is you reverse the direction of the stitches in every other block. - Bring your needle up at 1, across one thread of the canvas and down at hole 2. - Next, bring the needle up at hole 3, across 2 threads of the canvas, and down at hole 4. - The next stitch is made over 3 threads in the canvas (5 and 6) then down to two and finally one stitch. Uses: Highly textured filling stitch, backgrounds and border areas. 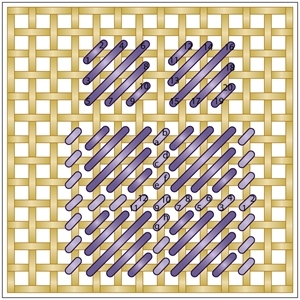 Similar to Cross Stitch, and is worked over an even number of threads in the canvas. 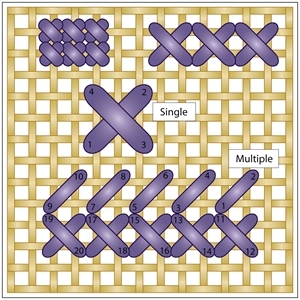 This illustration shows 3 threads. 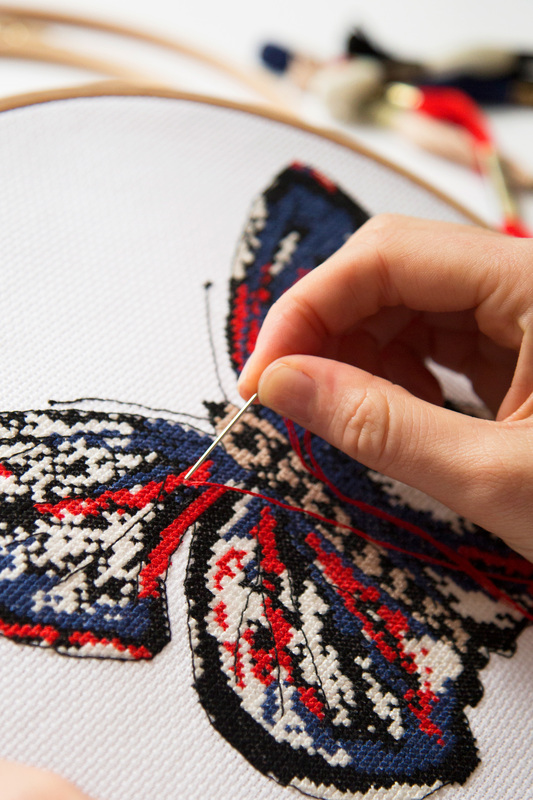 - This stitch is also known as a double cross stitch. Work a standard cross stitch, and then work an upright cross stitch directly over it. - Bring your needle up diagonally from lower left at point 1 to the upper right at point 2 over an even number of canvas intersections. - Next, bring the needle up at the lower right at point 3 and cross down to the upper left at point 4. This completes the first half of the Smyrna Cross. - To work the second half of the stitch, bring your needle up at the bottom centre at point 5 and down at 6. Bring your needle up again at the centre left at point 7 and down at the centre right at point 8 to complete a stitch. - The Smyrna Cross may be worked individually as a decorative element, or in rows. 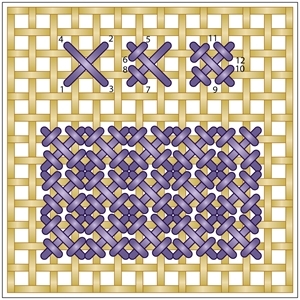 - Smyrna Cross is referred to as a double cross in surface and cross stitch embroidery.